The asparagus has started rolling in even though the snow is stilled piled up around town. Spring is somewhere and that somewhere is shipping in-season asparagus to me. Hurray! Every year, I attempt a new take on asparagus and I remember how much I love it. This year, I decided to make soup because it would make a lovely starter for an Easter meal. Soup can help you eat less of other perhaps less healthy things (think ham, mashed potatoes, deep fried chicken) by filling you up. The cream in this soup is nonexistent but I still called it “Cream of Asparagus Soup” because I am shifty like that. I used a little butter, a potato, and some yogurt to add “cream like” properties. If you don’t have fresh thyme – don’t worry about it. I used a regular blender (sorry Vitamix) and it came out great. What do you serve as a starter for a spring celebration? In a large sauce pan, saute onion in butter over medium high heat until translucent (about 5 minutes). Add asparagus, potato, thyme, and chicken broth and bring to a boil. Reduce to a simmer and cook until the asparagus and potato are tender, 10 to 15 minutes. Puree soup in blender and add back to pot. Mix in yogurt, lemon juice, and add salt and pepper to taste. Serve immediately or store in a tightly sealed container for up to three days. Oooo this looks so good! I love asparagus and recently discovered an asparagus soup at the store (not bad in points, but high in sodium). I wanted to try to make my own. Thanks! Can't wait to try this! 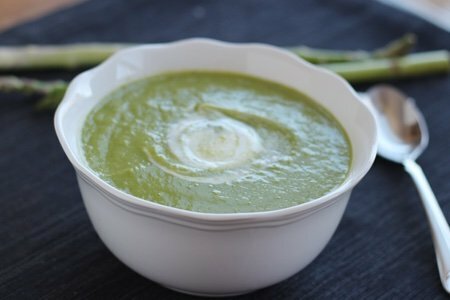 I had a WW Cream of Asparagus soup that I made years and years ago that I keep thinking of trying to locate, but I think this one is better. I was wondering one thing though... I recently found a really great Cream of Cauliflower soup that also doesn't have cream in it. It's just cauliflower, onions, garlic and other spices with veggie broth. Do you think swapping out the potato for cauliflower would work in this recipe? I imagine it would take more cauliflower than potato to get a creamy consistency. About how many cups does one medium potato yield? I may have to experiment (I happen to have both asparagus and cauliflower in my fridge - but no potatoes in my pantry). Anyway, sorry for so many questions. @janet - If I didn't have a potato, I would simply not use anything to replace it. The soup will be less thick but still really good. This looks great, Lisa. Thanks, will definitely give it a try ... possibly once with potato and another time with cauliflower! Thanks, Janet, as well! Just came home with one bunch of asparagus, trimmed it and it weighs about 12 oz....will also add some other veggie to make up the difference....I have cauliflower, green beans, tiny bit of baby kale, carrots...I say no to the green beans and the brussel sprouts I also have.....but what do you think would work best? Another similar recipe for Vicchyschoice (?) serves this cold...how do you like it best? I was thinking of using coconut oil instead of butter since it's healthier. I'm also putting butternut squash instead of the potato since butternut squash is 0 points on WW. I also thought a sweet potato would be much healthier than a white potato for those who are using a potato. I'm going to try this, but I am roasting the asparagus and butternut squash right now. The idea of boiling veggies reminds me of my childhood - I think that was why I never liked veggies. My mother would boil the taste away! I'll let you know how it comes out! This was easy and really good!